Review: "Tiles: Tiles/Fence the Clear (Reissues)" - Sea of Tranquility - The Web Destination for Progressive Music! From the first notes of the first song on Tiles' self-titled first album � that would be the criminally catchy "Analysis Paralysis" � it's clear this Detroit-based band that accessibly blends progressive metal, hard rock and plenty of intelligence into a neat and completely underrated package, is not a typical prog-metal group. 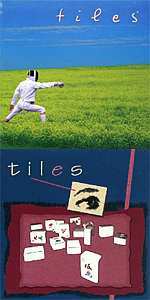 Sure, Tiles has its Rush connections, thanks to studio wizard Terry Brown and album-cover artist Hugh Syme. (Syme landed on the scene after the release of the band's first two long out-of-print albums, 1994's Tiles and 1997's Fence the Clear, but Brown mixed Fence the Clear.) And many riffs, passages and even entire songs sound like Rush outtakes. But for a band with so many Rush references, not to mention an outfit that takes its name from a Led Zeppelin song ("Out on the Tiles") and cites Gene Simmons as an early mentor, Tiles (and Tiles) sound amazingly fresh, if not completely original, a decade later on these Special Edition reissues. Much of that freshness comes courtesy of singer Paul Rarick's crystalline voice, which carries the depth of James LaBrie, the sincerity of Steve Walsh and, yes, the quirkiness of Geddy Lee. And guitarist and keyboard player Chris Herin, the band's main writer and lyricist, imbues Tiles with a savvy and contemporary sound that mixes mesmerizing arrangements with smart lyrics about real life and inner turmoil. To wit: "Sometimes the cost of winning/Isn't worth the price/This eternal battle/Edges many from the race/Brick walls form around me/Shaded from today/My good intentions/Keeping progress held at bay," from the debut's "Trading Places." And then there are the opening lines to "The Wading Pool," a piano ballad from Fence the Clear, which hauntingly albeit unwittingly prophesies Sept. 11, 2001: "We were watching as the buildings fell/And the ground folded/Minutes passed and the destruction was over/Dust and rubble fill the stagnant air/Blotting out the sun/The beauty lost in moments as the wars begun." Fence the Clear comes off alternately heavier and gentler than the debut but no less melodic and enjoyable, as the more-mature songs were honed from two years of testing them on live audiences. Listeners can hear the band segue toward a more progressive sound, as Tiles moves gracefully from noisy metal to a mellow yet groovy breakdown in "Another's Hand." Elsewhere, on "Changing the Guard," the band smolders in a slow-burn epic that rivals any of prog-metal's best ballads. Four bonus tracks include unfinished demos from the original Fence the Clear sessions (one, "Ballad of the Sacred Cows," wound up on 1999's Presents of Mind) and another demo from the Standing Pavement days. InsideOut Music's typically exceptional attention to detail further enhances both of these Special Edition titles, which have been remastered to sound better than ever. They also come with lots of photos and Herin-penned liner notes. (Presents of Mind was given the Special Edition treatment via InsideOut's European arm and is available in the United States only as an import.) All three albums offer a Tiles primer in anticipation of Window Dressing, the band's most progressive album yet (including the exhausting 17-minute title track opener), which is slated to drop May 25. It's about time Tiles gets the attention it deserves. To do your part, pick up Tiles and Fence the Clear, and find out what all the fuss should be about.